System to send bulk e-mails does not have to cost a fortune. I wrote such a system, and I would like to only a small sum of money that will help me in rehabilitation. I do not wish on anyone, anything for free. I can work and do it. phpBlueDragon LocalMailer system is designed mainly for people who want to send their letters to a large audience without having to send individual letters. Easily create new messages – no different from developing a normal e-mail message, you simply your server as the sender, recipient group, define the file as HTML and text and send. 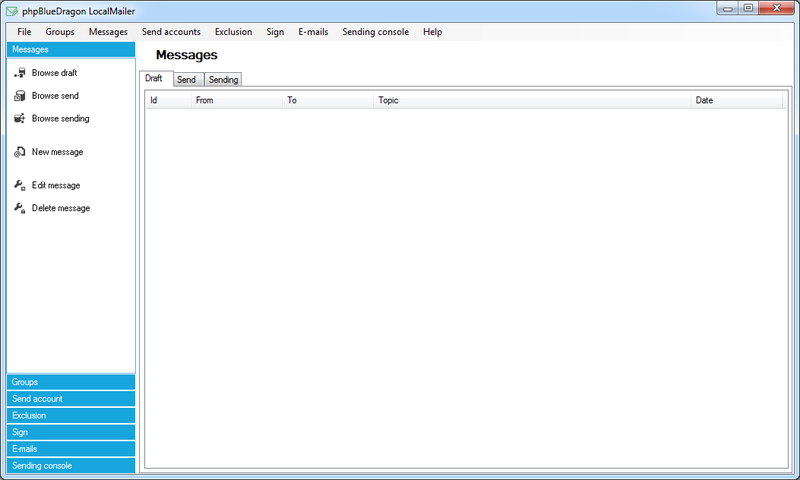 Adding attachments – if you want to you can immediately to your e-mail add any files that are sent as attachments. All recipients will receive it directly to e-mail. There are two ways to send a message, the first is the built-in connection and authentication servers, SMTP, and the second is specifically built library to handle outgoing mail accounts. As a result, regardless of blocking anti-virus will be able to search without the option to unblock the port, immediately send the list. Easy integration with your template how your choosing with the ability to paste HTML directly into the program. You can send newsletter list and you will have the same template, but the content will be a little different. Thanks to the program you one and the same e-mail edit as many times as you want. Management of grouped email addresses and the definition of additional data is possible by using groups. Each group comprises in addition to e-mail the data on the name, position and many others. These data can be inserted using special tags to the content of the letter e-mail. What would a program without the ability to quickly shift the e-mails to or from it. Were created with special features such as import – thanks to it, you can without too much trouble to add addresses, along with the data of people in just a few clicks. Export – allows you to create a copy of addresses by selecting the appropriate data that you want in the exported file were concluded. Ability to send an unlimited number of e-mails. By purchasing a license you can define any number of recipients. There is no restriction as in the majority of companies offering software on the server, where each group has its limit. Adding as much as you want. The ability to send unlimited amount of email accounts. The program offers you the opportunity to define an unlimited number of email accounts, so you can carry out mailings for several or a dozen companies. You do not need every time you delete the old account, so that there was room for new ones. In the program there are no restrictions.